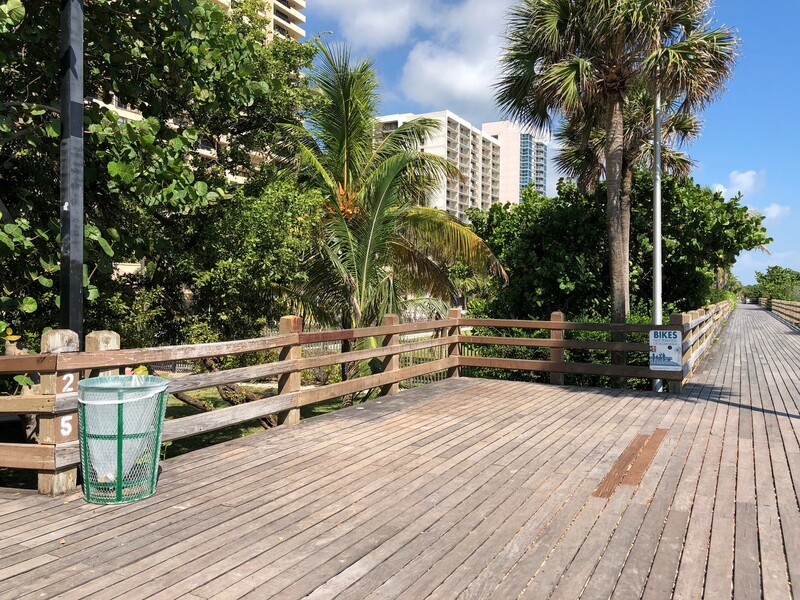 The City has begun removing the wooden pavilions on the Boardwalk from 25th to 45th Streets which area residents and members of the Miami Beach Crime Prevention and Awareness group say have become havens of criminal activity. The “huts” were originally slated to be removed in Spring 2019 but citing their deteriorating condition “as well as numerous concerns brought by neighbors,” City Manager Jimmy Morales wrote in a letter to Commissioners that there is “a need to expedite their deconstruction.” The first to come down was the pavilion at 25th Street (above). The structures at 31, 38, 41, 43, and 45 Streets will come down throughout the month of October. At the Commission’s Neighborhoods Committee meeting earlier this month, a number of residents and business owners expressed safety concerns about alleged criminal behavior and drug dealing from the “huts”. 25th Street and the Boardwalk now. As if the hut was never there. Meanwhile, following concerns expressed at that same meeting by one business owner about potential drug dealing on Ocean Drive that heightened tensions between a couple of Commissioners and Police Chief Dan Oates, police officers have been stationed on the 900 block. That in itself created a bit of controversy when Armand Meyara asked the cops not to stand directly in front of his display window or his doorstep. Meyara told RE:MiamiBeach he was happy to see the police presence but did not want them blocking the view of his display window or standing on his doorstep and he reiterated what he said at the Neighborhoods meeting, that the problem is not just in the 900 block of Ocean Drive but from 6th to 15th Streets and that he believes undercover police officers would be more effective. After a meeting with Oates, the officers are now located on the corner rather than in front of Meyara’s business. One thing Meyara and Oates agree on: There have been numerous narcotics arrests on Ocean Drive. The issue is how quickly those who are arrested are back out on the street.